Last time I wrote about authors not providing setting information at all, or not providing it soon enough. Not providing enough detail about the setting is a similar problem, but different enough that it gets its own post. Next time we’ll go to the other extreme and discuss providing too much information. It’s easy for an author to fall into the vagueness trap: after all, his mind’s eye sees the setting the characters are in. That knowledge becomes so ingrained that he forgets the reader isn’t right there with him: she doesn’t see what he sees, know what he knows, etc. In the end, details get left out, even when they’re new and important, and the poor reader becomes a member of the Fugawi Tribe (see Part 18 for an explanation of who they are). the activities that might be expected to take place there, to name a few. Mood: “It was a dark and stormy night.” While this famously bad opening fails for many reasons—how dark it was, how stormy it was, and what kind of storm was going on wherever the story was happening—Bulwer-Lytton was trying to establish a mood. Of course, weather isn’t the only way to establish mood and is probably the most cliché, so writers should use it with caution but the reader’s initial reaction to a dark place or a bright place only begins to set a mood. 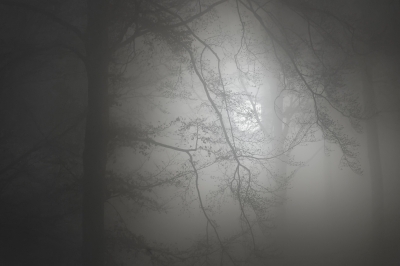 But even darkness alone isn’t enough information: consider the difference in mood for a couple in a dark forest and the same couple in a dark bedroom. That’s still not enough detail: they could be happy to be in the dark forest or terrified by being in the dark bedroom. The only way to properly set the mood is to provide enough detail. Culture and relationships: Think of the differences between, say, the England of Pride and Prejudice and Florida, Texas, and California of The Right Stuff. The cultures of Victorian England and America’s first astronauts were worlds apart, as were the ways in which they interacted with those environments and each other. Those differences will show in the settings in which the characters live and operate. Activities: Readers will have different expectations about what is likely to be happening in a hospital operating room (OR) and in a trailer at a construction site. Setting details can either confirm or upset those expectations. What if the OR is being used as a place where people are tortured, or the trailer is where a secret operation of some sort is being conducted? The details—the blood on the walls, the racks of special communications gear—provide the clues without the author having to come out and tell the reader what’s happening. Who or what is there—or missing: This can be an interesting and subtle point. Let’s continue with the operating room example. There’s a big difference between an OR that’s full of modern equipment, clean, and well-lighted, and one that’s nearly empty, dirty, and lit by just a single bare 60-watt bulb, isn’t there? Similarly, there’s a big difference between an OR that’s staffed with nurses, doctors, and technicians, one that’s empty and seems abandoned, and one that has just a single man in ratty fatigues holding an electric cord with bare wires at one end. Even these generic details tell the reader a lot. Within reason, the more details about the settings the author provides, the more the reader is able to inhabit the world of that moment of the story. In the end, this whole question of how much setting detail a writer needs to provide is like the quest for just the right word. You’ve probably heard of Mark Twain’s famous statement that the difference between the right word and the almost-right word is the difference between “lightning” and “lightning-bug.” (It seems to me that a better contrast would be between “lightning bolt” and “lightning bug,” but that’s an issue for another day.) In either case, the analogy is apt: either form of lightning—bolt or bug—provides inadequate illumination, just inadequate in different ways. Can I picture the time of the story or scene: the time of day, the season of the year, the century, or the era? Can I picture where the story or scene is taking place: the planet, the nation, the specific location? Do I have a sense of what the author wants me to expect is happening there? Is there enough information for me to even have expectations? What do the people and/or things who are there, or absent, tell me about this scene? Do they match or upset my expectations? Can I tell if that’s what the author intended? Now it’s your turn: What kinds of things make you realize that an author’s setting descriptions are too vague?